I already knew what recipe I was going to attempt. 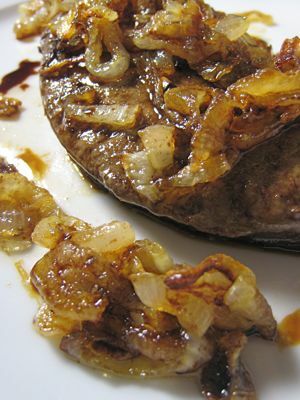 Fegato alla Veneziana is simple, quick and for many folks, an utterly brilliant way to enjoy calf’s liver. 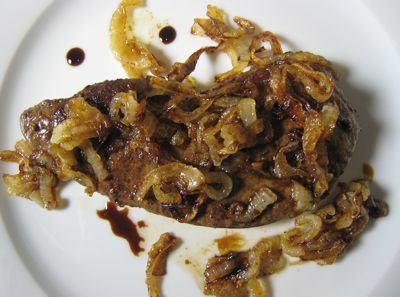 At its simplest, the calf’s liver is seared in a hot pan in a combination of olive oil and butter, then topped with lots of sweet slow-cooked onions. Some make a wine based glaze, others add balsamic vinegar, etc. This is how I did the version photographed in this post. Put a medium sized frying pan on a low flame and add some olive oil and butter. Add one medium sized, thinly sliced onion to the pan and cook this slowly for about 20-30 minutes, taking care not to burn the onions, but rather letting them caramelize slowly, drawing out liquid but leaving behind a natural sweetness that only onions can provide… Remove the onions and put them on a small plate. Drizzle the onions with a few drops of the best balsamic vinegar (I used a 10-12 year old balsamic, which poured like syrup) you have in the pantry. Return the pan to the heat. Remove the liver from the milk and drain on a paper towel. Season with salt and pepper and coat with a light dusting of flour. Sear in the medium hot pan for about a minute on each side (depends on the thickness of the slice) until just cooked through. Don’t overcook it or it will get tough. Move this to a serving dish, top with the caramelized onions, and add a few more drops of superb balsamic vinegar. Hmmm, not bad actually… I managed to eat half of this serving, a HUGE improvement and a step forward to overcoming the calf’s liver bias… but it still isn’t a favorite. It was tender, flavorful and apparently incredibly healthy… but the texture was still a bit off-putting… though I suspect it is something I could get used to if not for the now real fear of gout as a result of high uric acid! At about PHP70 for this individual serving and PHP20-25 of that for the vinegar (! ), I think this is an incredible bargain of a dish… and such a snazzy name to boot! Perhaps serving this in smaller slices over salad greens would help you overcome your distaste for liver? I used to hate whole chicken livers although, like you, I had no problem with pate. That is until I learned to make this salad of chicken livers prepared much in the same way you did with the addition of strips of pork belly. The “sauce” of balsamic vinegar glaze and evoo served as the salad dressing. The contrasts in temperature (cold greens, hot liver), texture (soft liver, crisp pork belly and salad greens) and taste (sweet-sour from the balsamic vinegar and onions) were just terrific. I figure it can work well with calf’s liver as well? Although the harder pork liver is really just blech. I love Fegato ala Veneziana. Cook the liver medium rare and you won’t have that sandy texture that puts you off. Pictures are great as always. i know some friends who love beef liver steak medium rare. i will try your recipe for them. the caramelized onions on top is a good addition & the balsamic, too. thanks MM. I like to cook liver the old fashioned way, marinated in Kikkoman soy sauce, lemon and a good sprinkling of freshly ground black pepper for 15 minutes or so. Fry in medium high to high heat using olive oil to desired doneness ( I like mine just a tad undercooked). Do not overcook or it becomes leathery. Remove liver from skillet, then fry lots and lots of onions, add 1/3 -1/2 c water and remaining marinating liquid and more freshly squeezed lemon juice if desired. Correct seasoning. After a rolling boil, pour liquid over liver. I seem to enjoy this recipe better than those with fancy names. You don’t want to make it any richer than it already is or it gets cloying. Just an opinion. my favorite…..wonder if our local liver can cut it…..
One of my favorite dishes. I have always thought that the veal liver in Santi’s was excellent. If I may suggest a variation to your recipe: I tend to dust the slices of liver in flour prior to frying. In addition to the sauteed onions I tend to add some diced tyrolian bacon. Another variant is to add sliced apples to the sauteed onions. Liver is high in purines (which are converted into uric acid), but so are foods like sardines and other oily fish. Liver is high in fat and cholesterol (it is where the body converts cholesterol to bile acids, which are then excreted through the bile ducts…which are some of the “veins” you see in liver). Fat-soluble compounds such as vitamin A are often stored in the liver (remember cod liver oil?) and it is possible to over-do it to toxic levels (death from vit. A toxicity is not unknown). I most often turn liver into a terrine or pate, but I have had liver in some interesting dishes…in Mexico, had chicken livers in a chipotle/tomato sauce; in Italy, with risotto, and of course liver dumplings in Bavaria…which if done well are absolutely delicious. This dish is one of my favourites and indeed it so easy to prepare. And economical as well! However, I cook the onions with about a glass or so of white wine, and for a longer time. The liver I cut into strips, then add them to the almost caramelised onion but still quite liquid and let the liver cook into the wine sauce. When done, I serve it with hot steaming polenta and a side green salad. I also found out that it holds quite long in the fridge, and is freezable. MMMMMM, I love liver, esp. prepared in this way!! I will always order this if it is on the menu. At one of my neighborhood restaurants, they prepare the liver in a similar way (i.e., with a balsamic vinegar based sauce), but with sauteed apples, frizzled onions, and a rasher of crisp bacon all piled on top. I applaud you for giving liver another chance and for making this dish, which is clearly not one of your favorites, look so delicious. i love liver but it has to be marinated in soy sauce, calamansi, garlic and salt and pepper…much like a filipino bistek. i then add the onion until it caramelises..yummy! Picture Perfect!!! I love eating Fegato ala Veneziana (make mine medium rare too) with lots of onions and rice! But its a good thing it happens only one’s in a blue moon, unless I want to be immobile from joint pain. it’s my first comment on your website though i’ve been coming here for months and months. personally, i LOVE liver. i don’t know what it is about it, but while others seem repulsed by the thought of it, i find the experience of eating liver famazing. i cook liver often but i have never tried this recipe… i will soon though!! maybe i can give you some recipes to help you get over that whole ‘not liking liver’ thing. philippine-way for me,but with lots of half-cooked onions, on the lemony side…. these days, not too often. I like pate and I love liver steak. Well, I enjoy any liver dish as long as it isnt tough (gives a different texture). Fegato alla Veneziana (or “FigÃ Ã ea Venessiana” in the Venetian dialect) should be cooked already sliced (“a fettine”) with the membrane (“pellicina”) removed.